On Friday we had a lot of fun with the instant alpha feature in Pages. 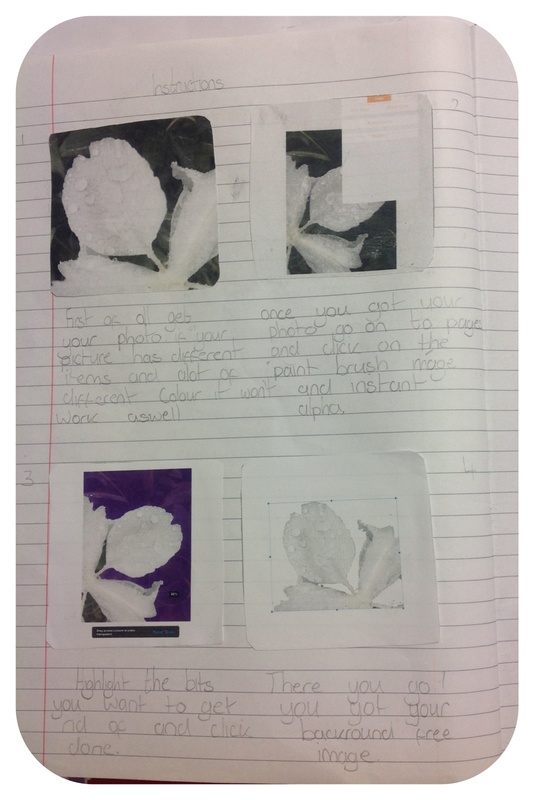 The children produced some brilliant work – as they so often do they exceeded my expectations and came up with different ways of using the same tool within an app. It was great to see them applying a range of skills to overcome problems with layering images. Today the task was to produce an instruction sheet to help someone else use this feature. I had already produced instructions for use on a Mac and we looked at this first and talked about the language of instruction. They decided that the instructions needed would depend upon who was to use them. A simple set using 4 screenshots would be appropriate for someone who was familiar with using an iPad. A more complex 8 image set of instructions would be required for a user who was unfamiliar with iPads. In order to prevent time being wasted searching for, or setting up the ideal picture I had put 6 suitable images into their Dropbox. To take 4 (or 8) screenshots. The lesson went well. Although it was meant to be an independent task there was some collaborative learning as they helped each other – they discovered that taking a screenshot of the tool in action required a high level of dexterity or an extra hand. The biggest problem we encountered was unexpected – usually when they email from the iPads they use an address saved in contacts. Today I was using a new email address so they needed to type it in themselves. At least one third of the class did this incorrectly leading to lots of conversations like this. I foresee a lesson on the importance of accuracy…and the difference between a postman and a computer. I haven’t finished marking the finished work, but I’ve been really please with the books I’ve looked at so far. Some of the children tested out their instructions on unsuspecting adults in school, hopefully next week we’ll find some more willing guinea pigs.